A SaBumNim is a guide and instructor, through whom your martial knowledge of skills will come. To be a SaBumNim means one has earned the honor to pass on the invaluable lessons and experiences of numerous masters and sages. To be a SaBumNim means always being there for one's students and striving to help them achieve their absolute best. To be a SaBumNim means not only having years of martial arts training, but also the ability to produce extraordinary students, Instructors and masters like all those below from individuals just like you. SaBumNim has been teaching for over 45 years. He is also a certified Zen meditation instructor. He has attained an 8th Dan in HapKiDo, 8th Dan in VSK Jujitsu, 6th Dan in Tae Kwon Do. His is currently the President of the World Pro HapKiDo Federation in the tri-state area. He is the only non Korean Master awarded by the WPHF for contributing to the development of present day Hapkido. He was awarded by the WTKDF for his contributions and support. Additionally, he is a referee for the WTKDF for Olympic TKD. He was a former president for the Chinese martial arts division of the Amateur Athletic Union (AAU). He has trained extensively with nine of the world's most renowned, respected and innovative Grandmasters and Masters of the Twentieth Century.These phenomenal martial artists include: Master Chin Yun Chung, Grandmaster Sang B. Ko, Soke John Davis, Grandmaster Jong Yuk Ki, Grandmaster J. Choi, Grandmaster Billy Davis, and Grandmaster Chih-Young Lin. They are all the foundation of Master Herbert's extensive skills,knowledge and understanding of martial arts. Chungsanim Master Dominick Brioche is a native of Haiti, and a three time Black Belt Hall of Fame inductee,. She holds a 6th degree Black Belt in Jujitsu, a 4th degree in HapKiDo, and a 4th degree in TaeKwonDo. Dominick is the first and only female Shihan in Kumite Ryu Jujitsu under Soke Lil John Davis. Certified as International Instructor in HapKiDo, Dominick has hosted seminars in New York City, Delaware, Washington DC, Haiti and the Dominican Republic. In her constant pursuit of excellence, ChungSaNim is furthering her formal education in Philosophy at the Doctorate level. Chungsanim Master Betty is a native of NY, and has been training under SaBumNim since 1997. Betty currently holds the rank of 4th Dan in HapKiDo. She has also trained in Wing Chun Kung Fu, Shaolin Kung Fu, Judo, and Jujitsu. Betty holds the rank of 3rd Dan under Soke John Davis in Kumite Ryu Jujitsu. A 3 year stint as a personal trainer and kickboxing instructor, studying directly under a former Mr. America, gave her a solid foundation in the anatomy of the body. Her main goal is to promote martial arts to the world as a way to achieve spirituality, health and empowerment. Chungsanim Master Brad was born and raised in Los Angeles and has been studying martial arts since the age of 10. He practiced several styles, attaining ranks in Tae Kwon Do, Shaolin Kempo, and in Kuk Sool Won before committing to HapKiDo at the WMAC. He currently holds the ranks of 4th Dan in HapKiDo and 2nd Dan in Kumite Ryu Jujitsu. As an instructor, Brad focuses on fundamentals, core concepts and conditioning. He has been teaching children's classes in Brooklyn since 2003. He was proud to see many of his students as part of WMAC's first group of junior black belts. Chungsanim Master Jill Zoll-Burdick has trained with Master Herbert since 1998 and has a 4th degree black belt in HapKiDo. She has the rare ability to teach HapKido and martial arts to children as young as 3 and to the elderly. She specializes in joint locking, special weapons and tactics. She graduated from Fashion Institute of Technology with a degree in Fashion Design. She has been a buyer and in product development. She is the USA Sales Manager for Edge Accessories and is married with 2 children. Kyosanim Advanced Instructor Holly Kozak was born in Ukraine and immigrated to the US in 1990. She has trained with Master Herbert for over 17 years and is a 3rd degree black belt in HapKiDo. Holly Kozak is a nurse practitioner on the stroke team at Maimonides Medical Center and she teaches graduate students as adjunct faculty at NYU School of Nursing. In addition, Holly is a Licensed Acupuncturist with a degree from Pacific College of Oriental Medicine. Holly has trained many students towards their black belts and continues to teach as an instructor on a regular basis. Holly's focus and emphasis is on quality and precision. Senior Instructor Kelly Rutkowski began her training at WMAC in 1998 and currently holds the rank of 3rd Degree Black Belt. She also has trained in Judo and Muay Thai. Kelly is a NYS Licensed Acupuncturist with a Master of Science in Oriental Medicine from the Tri-State College of Acupuncture. Senior Instructor John Romano is a native New Yorker born in Brooklyn. He is a 3rd degree black belt. John has trained with Sabumnim Herbert for nearly 15 years and has taught and assisted over 500 classes in HapKiDo and Judo. As a compliment to training at WMAC, John has also trained in other forms of HapKiDo as well as Judo and Kumite Ryu Jujitsu. Senior Instructor Rosa J. Cho has been studying HapKiDo under Master Herbert at WMAC since 2001 and is a 2nd degree black belt. She has also studied wushu, kickboxing, yoga and swing dancing. Believing in the power of achieving health through empowering one’s mind, body and soul, she brings a lot of positive energy and enthusiasm to every class and cares for each student’s paths to well-being and empowerment. Rosa recently earned a Ph.D from the NYU Silver School of Social Work, and is working on socioeconomic justice and women’s rights issues. Certified Instructor Janet Rutkowski has been training in different martial arts styles for 20 years. She started training in Hapkido at WMAC over a decade ago, and is currently preparing for her 2nd dan black belt. Janet is passionate about teaching children, which she has been doing at WMAC for 7 years. She is loved and cherished by many of our WMAC kids. Janet is an accomplished metal sculptor, and has her work shown in many NYC and upstate galleries. Certified Instructor Rej Joo started his martial arts journey as a pre-teen when he received his junior black belt in TaeKwonDo at age 12. However, he took a break from martial arts for 15 years until he found WMAC in 2011. He began teaching as an Assistant Instructor for children's classes in 2013, and later also started teaching adult classes. Rej earned his 1st Dan Black Belt in HapKiDo in 2015. He holds an MPH from Columbia University and works at the Center for Anti-Violence Education, where empowerment self-defense classes are offered for survivors as well as Upstander workshops are offered for the public. Certified Instructor Marc Hungerbuhler has studied Martial Arts since early childhood. Born and raised in Switzerland to a Korean mother and Swiss father, his early practice was contextual. Max Hungerbuhler his father was the president of the Swiss Budo federation in 1955, and a 5th dan in Judo, the position was handed over from his grandmaster Hanho Rhi who founded the Swiss Jiu-Jitsu and Judo federation in 1937. Growing up, Marc was trained in Judo by his father and his students who continued the dojang as principle instructors until the late 80s. 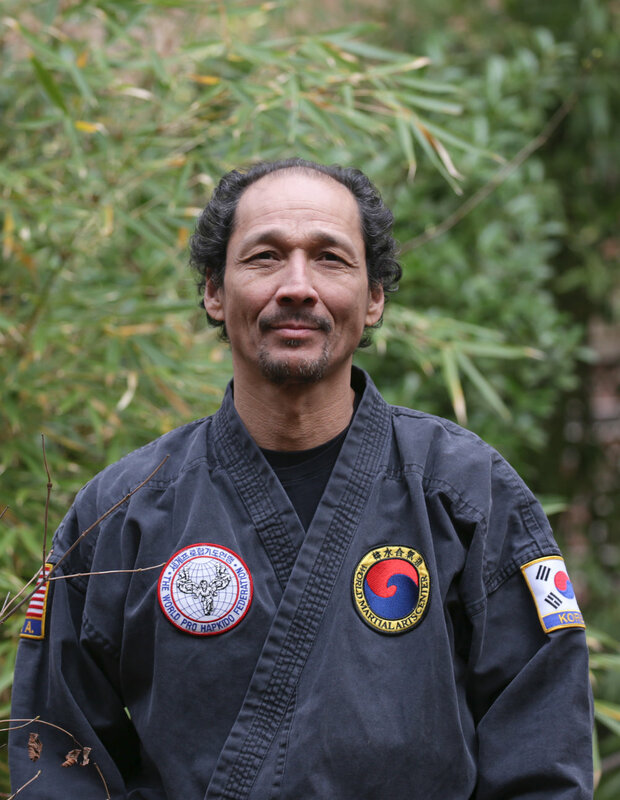 Twenty-five years later, enrolling his own children in the Hapkido School of Sabumnim Master Herbert, Marc reentered Martial Arts training in New York and has studied at WMAC since 2005. Chungsanim Master Jonathan Waks received his 1st Dan Black Belt in HapKiDo in 2001, a 2nd Dan in 2004, 3rd Dan in 2010 and 4th in 2015. In addition, he also holds a First Dan – 2008 in VSK Jujitsu - Soke John Davis. Jonathan has over 1500 teaching hours, and has led specialty seminars in weapons, sparring, falling, philosophy, meditation and teacher training. He works as an event and marketing producer in Manhattan. Senior Instructor George Brisset moved from France to the United States in the early 1990s. He trained in Tae Kwon Do in France for 10 years, and has trained in HapKiDo under Master Herbert for 20 years. George recently completed the Tai Chi Instructor's Certification Program. Senior Instructor Carol Glasgow was Born and raised in London, England. Carol received her 1st degree in 2001 her 2nd in 2008 and her 3rd degree black belt in 2010. Carol has over 22 years of martial arts training and also received her 1st degree in Kumite Ryu Ju-Jitsu in 2007 under Soke “Lil John Davis. After she moved to New York City in the 1990, she fell in love with martial arts and continued with her fitness training and in late 2003 she launched Kick Fever Fitness. Carol believes in empowering men and women by teaching martial arts, self-defense and fitness. Carol is also a certified personal trainer. Senior Instructor Michelle C. Alcala is a 2nd degree black belt and began studying HapKiDo under Master Herbert at WMAC in 2001. She has taught and assisted, children and adult HapKiDo and Judo classes at WMAC for over a decade. She has also studied Judo, Capoeira and Yoga. She believes that studying Hapkido provides many beneficial aspects such as; self defense, physical fitness, focus, perseverance, leadership and overall well-being and she is dedicated to instilling these values in her teachings. Senior Instructor JP McDavid is focused on the holistic method of living and teaching by creating balanced and fulfilling lives. JP was certified in 1994 by the American Aerobic Association International (AAAI) and Full Circle Life Coaching with David-Dorian Ross. JP has accumulated 30 years of teaching experience. He is a 2nd Dan in Han-Su Hapkido, and a senior instructor at WMAC. He is the creator and owner of Enercize, a corporate and individual holistic Wellness Company that promotes Wellness through presentations on the power of choice in our lives. Certified Instructor Jacques Philipe Piverger began studying martial arts when he was 5, and earned his black belt in HapKiDo from Sabumnim David Herbert in 2015. His children are also practitioners of hapKiDo. Jacques-Philippe has maintained a daily transcendental meditation practice for many years, which he credits for an increasing sense of peace and oneness. He is an entrepreneur having founded or co-founded a number of for profit and for purpose enterprises. He received his undergraduate from Georgetown University and an MBA from Dartmouth. He was a Term Member of the Council on Foreign Relations and he's been designated a Young Global Leader of the World Economic Forum. Certified Instructor Delta Hunter has been training in HapKido since 2009, and teaching adult classes since 2014. Delta’s classes are high energy, focused on building core strength and learning HapKiDo fundamentals. Delta is a NYS Licensed holistic psychotherapist with a private practice, a meditation instructor and a portrait photographer. Kyosanim Advanced Instructor Eva Vaccaro was born and raised in Hamburg, Germany. After beginning her training in Hapkido under SaBumNim Herbert, her passion shifted to include the Healing Arts. She holds a 3rd Dan in Hapkido, and a 1st Degree Black Belt in Kumite Ryu Jujitsu under Soke Lil’ John Davis. Eva has been a Certified Pilates Machine and Mat Instructor, a Certified Fitness Trainer, and is currently certified with AAAI/ISMA. Eva is an herbal practitioner certified by Clayton College of Natural Health. In 2012 Eva completed her training to become a Holistic Health Coach and is a member of the American Association of Drugless Practitioners. Senior Instructor Shira Beery is a 3rd Dan HuBae in HapKiDo. She was born and raised in New York City, and began training under SaBumNim in 1998 at age 10, along with her older brother Tal. She was hooked during her first class, when SaBumNim told her to do a jump front kick and she succeeded! After a short stint in the children's classes, she began training with the adults and became an Assistant Instructor at 12. Shira is extremely fortunate to have grown up with SaBumNim and the WMAC community, her second family, and sees her training as the path to an empowered, healthy, and meaningful life. She holds a BA in International Relations from Stanford University and an MBA from Yale University. Senior instructor Mindy Nam has over 25 years experience in marital arts with a black belt in Tae Kwon Do and is working towards her 3rd Dan in HapKiDo. She is also a student of Chi Gong, Tai Chi, yoga and energy work. She is an attorney and is active on many boards of charitable organizations. Senior Instructor Douglas Graham is a 2nd dan black belt who has been training in hapkido at WMAC since 2007, and teaching since 2010. Douglas recently retired from a career of teaching and administration within the NYC Department of Education. He believes that individuals learn in many different ways, and that a good instructor adapts his teaching style to the learning style of the student. He believes that a well grounded practice of martial arts is a lifelong learning commitment that helps to keep one physically and mentally fit, which is essential for a safe life in our constantly changing world. Senior Instructor Pete Caban was born and raised in New York City. He began his training at WMAC with Master Herbert in 2009 and has reached 2nd Dan Hubae. Pete has taught over 3 hundred adult and children's classes, and specializes in sword and dagger. Pete believes that martial arts training improves people's lives and makes them better human beings, and he is devoted to sharing his understanding of HapKiDo with new students. Certified Instructor Sung E Bai started training in 2006 and earned her 1st Dan Black Belt in HapKiDo in 2015. She began teaching as an Assistant Instructor for children classes in 2012, and later also started teaching adult classes. For over 3 decades, she has been a social justice organizer and was a certified advocate for domestic violence / sexual assault survivors for over 10 years. a leadership coach since 2008, she holds MA and MPhil degrees from Columbia University. Certified Instructor Lauren Segal directs the children’s program, including the afterschool and camps, and manages much of the daily operations at WMAC. Lauren began her training in HapKiDo in 2012, and has been teaching the children’s classes for several years. She also teaches an adult class on Mondays, which is a high energy, focused 45 minutes.